Created as an opportunity to explore collaborations between researchers and clinicians, the inaugural Research Runtime was recently hosted by UNSW Medicine and brought staff together to explore the theme of Invasion and Evasion – cancer, infectious diseases and immunology. Attendees were from the UNSW Medicine Themes Cancer and Triple I as well as partner organisations participating in the Sydney Partnership for Health, Education, Research and Enterprise (SPHERE). UNSW Medicine, as a motivator, offered a $5,000 award to one of the new collaborative teams for a project that developed out of the event. The 90-minute session began with two speakers whose work reflected the broad scope of the theme, followed by speed-networking where staff could speak with several people from other departments, organisations and disciplines, and then concluded with informal conversations over refreshments. Dr Sarah Sasson, an Immunologist at Blacktown Hospital and Associate Lecturer at the Kirby Institute, spoke about her transition into Cancer Immunology research. Professor Shan Rajendra, Professor of Medicine (Gastroenterology) at UNSW and Clinical Academic Gastroenterologist/Interventional Endoscopist at Bankstown Hospital, then spoke about his discoveries around a strong association between high risk human papillomavirus (HPV) and Barrett’s dysplasia/oesophageal adenocarcinoma. 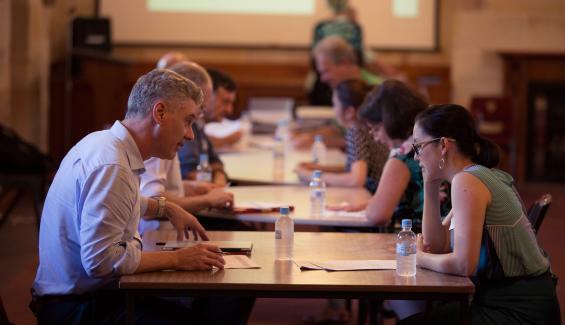 Feedback from the session was overwhelmingly positive, with staff sharing that the event’s relaxed environment and the extensive opportunity for collaboration contributed to its success. Further Research Runtime events are being planned. To follow the latest news and events from the Cancer Clinical Academic Group, subscribe to their newsletter.